Annual returns can be a useful performance measure, but it’s often overemphasized by the investment sales literature. It’s also sometimes used interchangeably with annualized returns, creating confusion because these are two very different performance measures. Please see my post on Annualized Returns or CAGR for details on how annualized returns (sometimes referred as CAGR) are calculated. 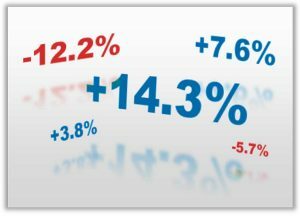 Annual returns generally refer to the set of returns of an asset or a portfolio during each calendar year over a period of multiple years. In other words, it shows the return you would have achieved each year if you had purchased that asset during the investment period. The bar chart below shows the annual return, excluding dividends, for the S&P500 index over the 15 year period from January 1999 to December 2013. Since we cover 15 calendar years, there are correspondingly 15 annual return figures, one for each calendar year. Beware however! Annual returns only tell you part of the story. 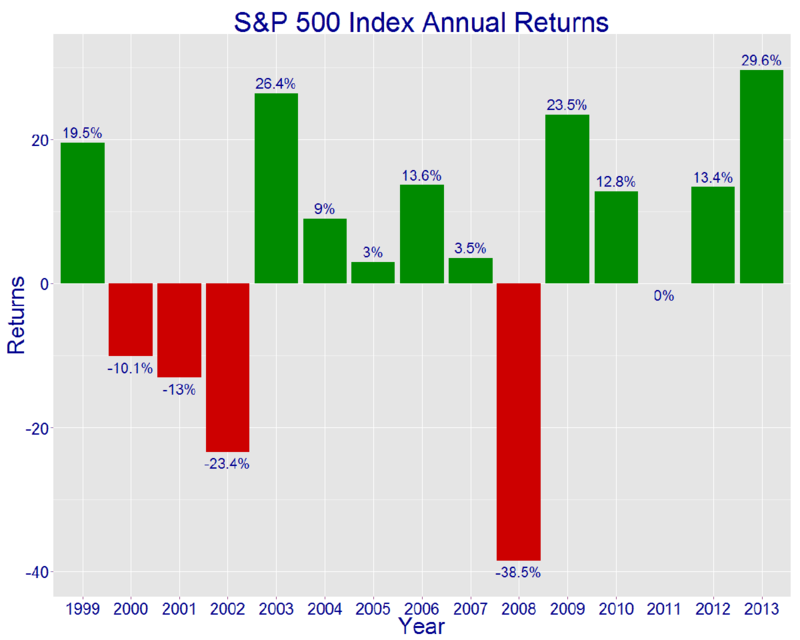 For example, 2009 looked like a great year on this chart, closing with a +23.5% return. However, the S&P500 hit its worst drawdown since the Great Depression in March of that year, losing more than 50% of its value from its peak in December 2007! Similarly, 2011 appears to have been a quiet year closing with a 0% gain but in reality, this was the year when the US government couldn’t agree on its budget which resulted in a lot of volatility during that summer. As is usually the case with investing, don’t be afraid to dig deeper. Annual returns only tell you part of the story. It’s often best to look at the daily closing prices to see get a real sense of the asset volatility.